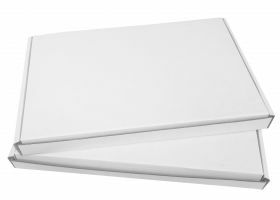 These smart white postal boxes – small pizza-style mailing boxes – are a convenient C5 / A5 size. They’re a handy solution to post safely and securely a wide range of items, from silk scarves to DVDs and slim books, all at the economical Royal Mail large letter price. Made from strong rigid cardboard, our white mailing boxes are self-locking with the sides tucked in and providing triple thick extra protection. Supplied flat-packed, they are quick to assemble and have a surface you can easily write on or stick labels. If desired, use tape to seal. Our postal boxes for shipping can easily be customised. Made from recycled material, and can be recycled. To view our full range of White Postal Boxes click here. Available in packs of 25, these flat-packed cardboard postal boxes offer a versatile and protective mailing solution that’s both professional-looking and cost-effective. They measure 235 x 160 (length x width x height, internal dimensions), which fits into the money-saving large letter postage class, and are suitable for A5-sized shallow items. 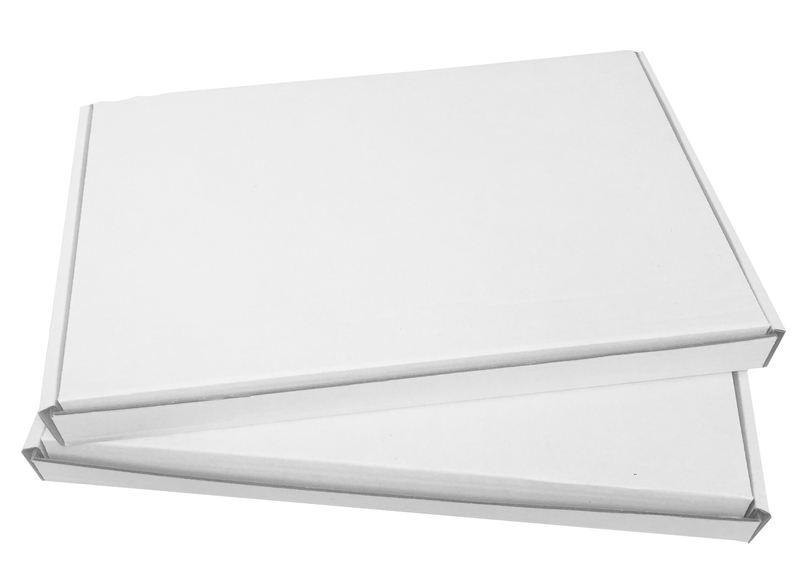 With a smart white outer, our mailing boxes offer the perfect presentation for direct mail marketing, promotions and gifts. You can save time packing thanks to the clever self-locking feature which means you don’t need packaging tape or glue unless desired. The boxes are delivered flat-packed and are pre-creased with an impression in the card to facilitate folding the box in the right place. You simply fold over the sides, slot them into place and tuck the top flap in the front. This feature has the benefit of adding extra strength and rigidity to the box as it forms a triple thickness at the sides. The inside of the box is smooth brown board, and the white outside can easily be labelled or written on – it is also perfect for customisation. Ideal as small mailing boxes for books, documents, brochures or CDs, our postal boxes are convenient to store and easily assembled.